The auto shows being one of a kind initiative by PakWheels.com, are aimed at providing a unified platform for car enthusiasts to share the mutual passion for cars from all over Pakistan. Started back in 2011, these auto shows have become a trend among the automotive community nationwide. From exotics to tuners, to 4x4s and classics, there comes a variety of cars. This time around, PakWheels.com is geared up for its upcoming auto show in Lahore. 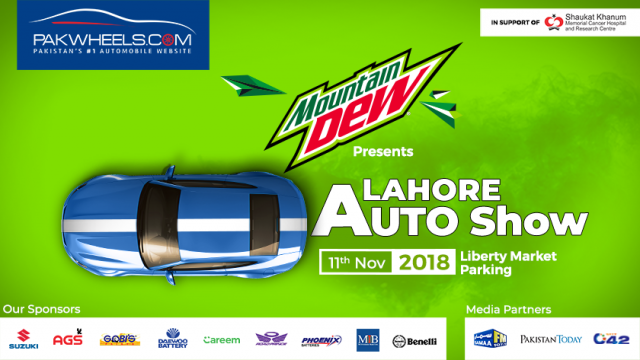 The Lahore Auto Show is the 8th auto show in the city, which will be held on 11th November 2018 at Liberty Market from 11:00 A.M onwards. Just like every year, this time too, the show will feature six main categories of vehicles including vintage, exotic, luxury, modified, 4×4 and bikes and there will be more than 800 rides at the event. As expected, there will be thousands of visitors, out of which, some of them will be there to showcase their cars and others to enjoy the fun-filled day with their families and friends. Yes, you read that right! The event will be a mix of cars, bikes, food, and music. To submit your ride, click here. Our esteemed sponsors of the event are Suzuki, AGS, Gobi’s Paint, Daewoo Battery, Careem, Road Prince, Pheonix, MIB, and Benelli. And our media partners for the event are Samaa FM, Pakistan Today, and City 42. Other than this, understanding the social responsibilities, PakWheels.com, in support of Shaukat Khanum Memorial Cancer Hospital, help in raising funds for the cancer patients. After the successful first Certified Car Mela in October 2018, PakWheels.com is all set to bring yet another car mela in Lahore very soon.